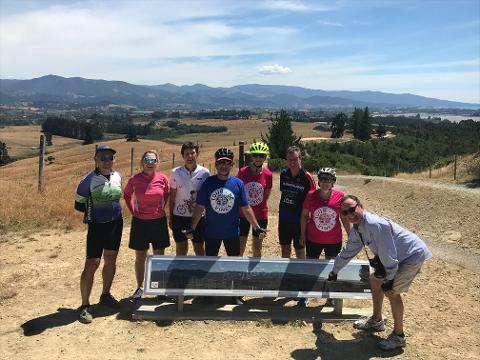 This is the perfect trip to experience stunning natural landscapes, arts and artisans, wineries and local cuisine on a fully guided bike tour. Kiwi Journeys arrange everything and limit the tour to ten people, so your experience is remembered forever. 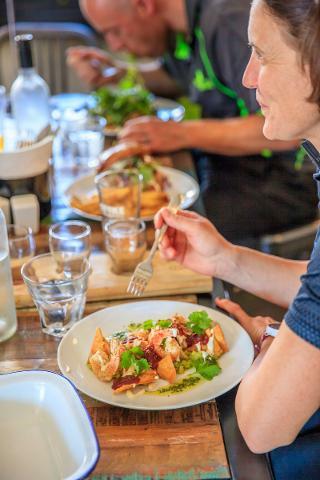 This FULLY GUIDED cycle tour allows us to guide you to tastiest spots in Nelson and Tasman. 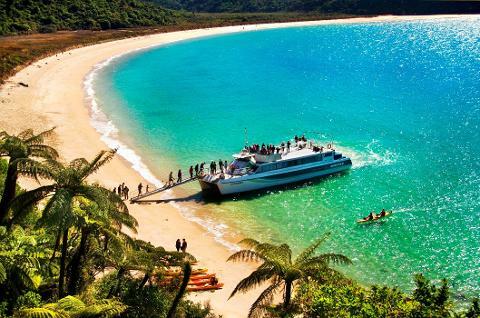 Includes a cruise of the World Famous Abel Tasman National Park and lunch at Awaroa Lodge. For an exclusive experience this tour is limited to 10 people only. 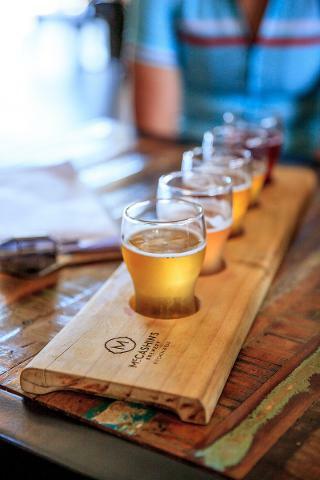 Kiwi Journeys have made this tour to be hassle free , full of fun and taste! 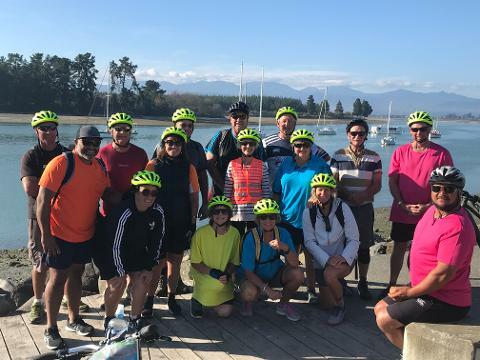 Get your group together, or join one of our set departures, and cycle in some of the most stunning scenery in New Zealand. 2019/2020 departure dates now available. BOOK NOW! Kiwi Journeys will meet you from your flight or bus trip and and transfer you to your accommodation in Nelson, or you can make your own way there from 3pm. 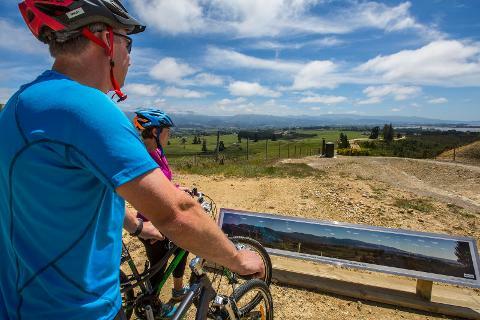 Relax, acclimatise to the beautiful Nelson region and prepare to experience anextraordinary bike tour. At 6.00pm, you will be met at your accommodation by your guide who will give you a brief run down of what to expect over the next five days. Your guide will then take you to one of Nelson’s top restaurants, the Cod and Lobster Brassiere, for dinner. Your adventure starts today. 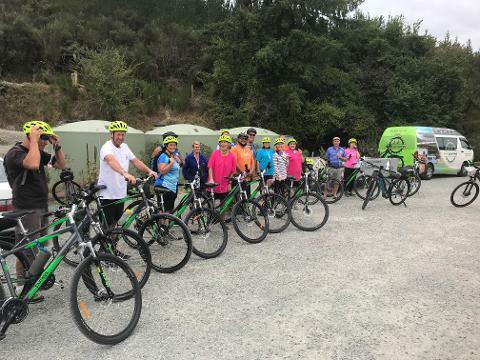 Your guide will meet you at our depot around 9.00am, where we will fit you to your bike, and give you all the information you will need to enjoy your cycling holiday. Your first morning of cycling takes you along the old rail corridor. We will stop at the ‘World of Wearable Art’ (WOW) museum before continuing our way around the Estuary towards Richmond. We will call into the Te-Mania/Richmond Plains winery where there will be a chance to sample and purchase some of their award-winning wines. A fantastic lunch is not far away at the Grape Escape cafe. 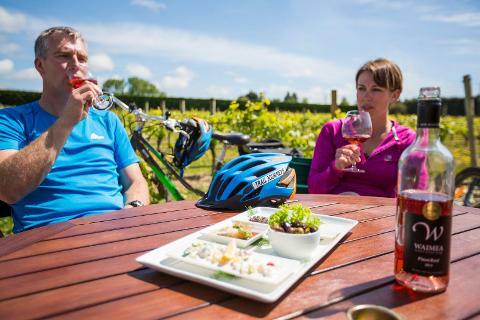 After lunch there is some gentle cycling amongst gorgeous vineyards, orchards and farmland. Wakefield, where you will stay in Bed & Breakfast accommodation. This is a very relaxed day, and no need to be in any hurry! You will be picked up at 8.30am this morning and transferred to Spooners Tunnel. 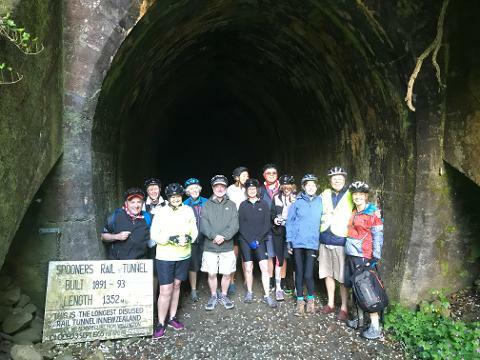 This section is a highlight for many, the ride through “Spooners Tunnel” is 1352 metres long, it is the oldest disused rail tunnel in the southern hemisphere. A lovely downhill gradient takes you down to the Wai-iti Domain where our driver will pick you up again and transfer you over the Pigeon Valley summit, down the Dovedale Valley to Woodstock. Whilst the distance is a bit longer today it is mostly downhill and flat and we are also supported by the van. On a nice day a swim in a Motueka river makes for an invigorating dip. We have a secret swimming hole which is just before our amazing winery lunch and wine tasting. 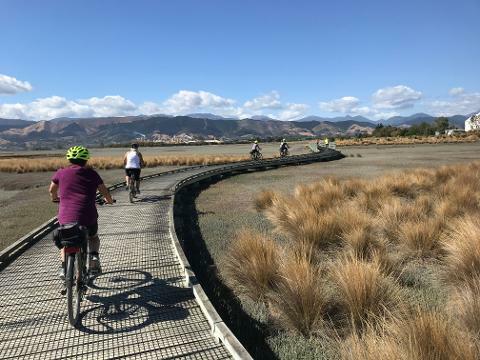 The ride into Kaiteriteri takes in boardwalks, bridges, farmlands and orchards before entering the ‘Easy Rider’ trail of the Kaiteriteri Mountain Bike Park. Once you enter Kaiteriteri, you can explore the famous golden sands and atmosphere of this beautiful town, the gateway to the famous Abel Tasman National Park. An incredible day awaits, exploring the stunning Abel Tasman National Park (some say the eighth natural wonder of the world!). The Abel Tasman National Park is renowned for its world-famous coastal walking track, its golden sand beaches, unmodified estuaries, sculptured granite cliffs and mild climate. Your day starts with an 8:40am check-in at Abel Tasman Sea Shuttle. At 9.00am you will be whisked away up the coastline of the Abel Tasman, enjoying a commentary from the experienced skipper. At 10.15am you will disembark at Tonga Quarry and enjoy a peaceful walk (1.5hrs) to Awaroa Lodge for a relaxed lunch. 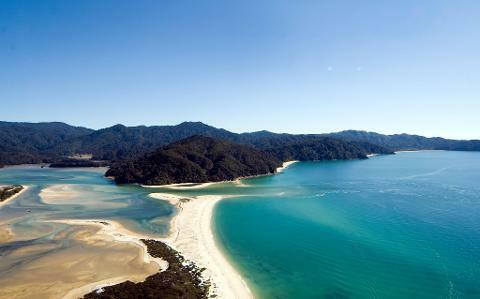 Awaroa Lodge is located in the heart of the Abel Tasman National Park with no road access! It has accommodation, restaurant and a bar. 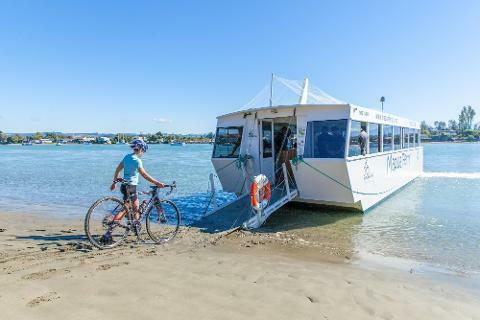 Your Sea Shuttle will leave Awaroa beach at 2.45pm and deliver back to Kaiteriteri beach by 4.20pm. After breakfast we jump on our bikes again, bound for Mapua. This is a leisurely ride with many scenic attractions along the way. 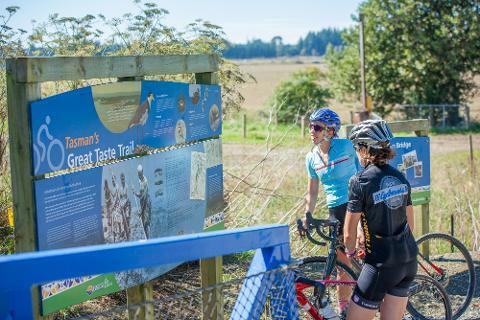 We re-trace our steps back to Riwaka (Coffee stop anyone? 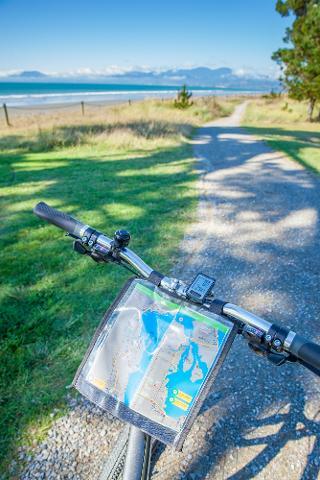 ), and make our way around the coastal trail of Motueka, enjoying the variety of bird species and scenery. On leaving Motueka we will pass through the Riverside Community, (great café here called Riverside Café) then head up over Tasman View Road. This section is grade two to three and is a steady climb (great on an eBike!) The spectacular views of Tasman Bay make it all worth it! Onward to the charming village of Tasman, and then past New Zealand’s number one café, ‘Jester House’ where we enjoy a lunch stop. Enjoy the lovely gardens & feed ‘Tame Eels’. 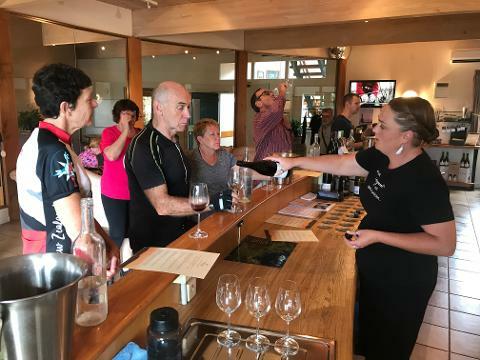 Our final stop for the day is in Mapua where we will finish at the Rimu Grove Wine Bar, which stocks a huge selection of wines from around the region. Mapua is a lovely seaside town which has a buzzing atmosphere of galleries, studios, restaurants, cafes, shops, & craft beer. Our final group dinner is included at the premium restaurant, Jellyfish. Today we board the iconic Mapua Ferry for the short trip across the channel to Rabbit Island. This is a relatively short day bound for our final destination, Nelson. The trail takes us along the main beach of Rabbit Island where long white sandy beaches and the peaceful surroundings are very calming. Upon leaving the island we take a side excursion to the oldest family run winery in the South Island, Seifried’s Estate. 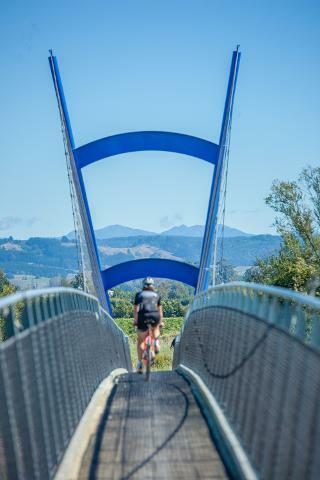 The trail traverses the Waimea Swing Bridge, before taking in the views from the coastal boardwalks of the Waimea Estuary and fertile farmland, (home to a range of internationally significant bird species including the white heron). Lunch is at the Honest Lawyer, which is an “Olde Worlde English Country Pub” situated on the Monaco Peninsula. From here choose to be picked up and taken to the airport etc, or it is a short ride heading back to Nelson for your onward journey. · Please note that a reasonable level of fitness is required for this tour. Please don’t let this put you off! You can opt for an e-bike for an additional cost of $54 per day. E-Bikes are super fun, they make it easy, and allows more people that may not have the required fitness level to experience 5 days of magic. · Departure transfers / accommodation can be arranged. Please inquire.